Sam Faustine as Seymour Krelbourne and Mary Kalita as Audrey in “Little Shop of Horrors.” Photo Credit: Erik Scanlon. Experienced theatre lovers know that great theatre requires a great community, of audience and performer alike. Great scripts, fine acting, skilled direction, and a first rate production team can accomplish great things, but true theatrical miracles grow out of a community of players and a loyal audience who love them. With their current production of Little Shop of Horrors, Ray of Light brings us one of those miracles. From beginning to end, this production is a love fest between an enthusiastic, committed ensemble, and an audience who appreciates. Ray Of Light is a company with a community feel, combining amateurs and professionals who are devoted to having fun and doing great work. They understand where the magic comes from, and they deliver. At a time in our city’s history when local artists desperately need to be reminded of what San Francisco can produce, Ray Of Light is a burst of sunshine, a shooting star that belongs in the uniquely San Francisco galaxy that includes the Grateful Dead, the “San Francisco Sound,” Beach Blanket Babylon, and the immortal Cockettes, among others. Let me make this clear: Ray of Light! San Francisco Loves You! Thank You! Thank You! Thank You! Now on to the play. The plot: goofy. The songs: good ol’ rock’n’roll. The performances: comic. It’s about a nerd who grows a man-eating plant that sets out to take over the world, a comically sadistic dentist, a kooky love interest, and, a few other eccentrics, with a trio of sassy backup singers. Seymour, Audrey, and Audrey II. Caricature by Argyle C. Klopnick. As the nerdy amateur botanist in his Ray of Light debut, Sam Faustine displays the acting skills and remarkable musicianship that have led him to play lead roles with many of the Bay areas’ most distinguished musical companies from Broadway By The Bay to Lamplighters to the choir at Grace Cathedral. As his love interest, Audrey, Mary Kalita is his goofy match and sings and totters about like a demented angel. If it were possible to steal the show, Brendon North would do it as the madly sadistic dentist Orin. North doesn’t just chew the scenery, he shreds it to confetti. But he still can’t wrest the show from the rest of this ensemble. Every performer is so committed to going over the top at every moment that to be in the audience feels like sitting in a meteor shower. That pretty much sums it up for this one: Go. Have a ball. And then you’ll probably want to see it again. “Little Shop of Horrors” plays through October 8, 2016, at The Victoria Theatre. For further information, click here. 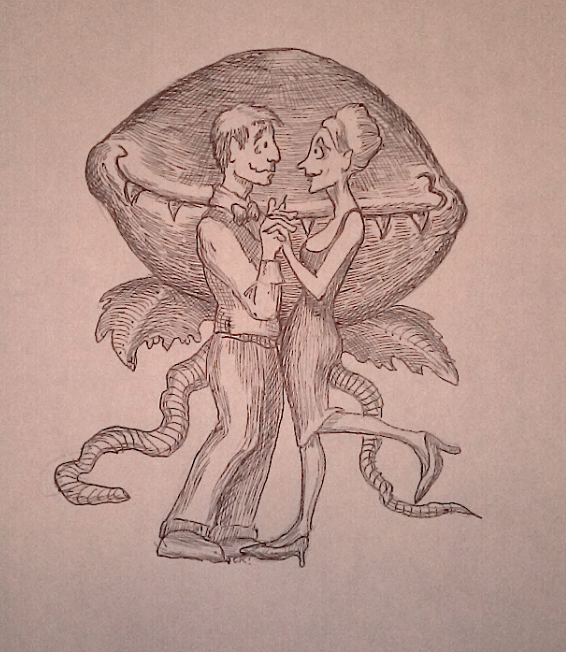 “Little Shop of Horrors” by Howard Ashman (book & Lyrics) and Alen Menken (music). Produced by Ray of Light Theatre. Director: Jason Hoover. Music Director: Ben Prince. Choreographer: Lauren Rost. Scenic Designer: Chrissy Curl. Costumes: Maggie Whitaker. Lighting: Kevin Landesman. Sound: Anton Hedman, Toni Babbitt. Props: Katie Iannatello. Audrey II: Jessica Coker. Ronnette: Jacqueline Dennis. Seymour Krelbourne: Sam Faustine. Mr. Mushnik: Tim Hart. Chiffon: Phaedra Johnson. Audrey: Mary Kalita. Crystal: Katrina McGraw. Ensemble/Puppeteer: Josiah Minued. Orin Scrivello: Brendon North. Ensemble/Puppeteer: Billy Raphael. Posted in Reviews.Tagged Ben Prince, Brendon North, Charles Kruger, Jason Hoover, Jessica Coker, Little Shop of Horrors, Ray Of Light, Sam Faustine, San Francisco bay area theater reviews, theatrestorm, Tim Hart.